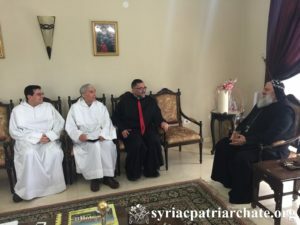 His Holiness Patriarch Mor Ignatius Aphrem II received a delegation from Taizé Community in France, at the Patriarchal Residence in Atchaneh – Lebanon. the delegation was accompanied by His Excellency Mgr. Toufic Bou Hadir, President of the Maronite Patriarchate’s Youth Department. During the meeting, the delegation invited His Holiness to a global ecumenical youth gathering, organized by Taizé in Lebanon during 2019. His Holiness blessed the efforts of the community in promoting ecumenism, and spoke about the significant role of youth in the daily life of the church. The meeting was attended by Very Rev. Raban Joseph, Patriarchal Secretary and Media Office Director, and Very Rev. Raban Jack Yakoub, Director of the Suryoyo Patriarchal Youth Department.